US emissions reduction goals for 2025 could not be achieved without nuclear power and the fracking technology necessary to extract shale gas. Recent revisions by the EPA in its estimates of methane leaks from natural gas production and use do not negate the benefits of gas in reducing emissions. In its lead editorial yesterday, the Washington Post took presidential candidate Bernie Sanders to task for his attacks on nuclear power and natural gas. The Post focused its critique on greenhouse gas emissions and the emissions trade-offs involved in substituting one form of energy for another. That speaks directly to one of the main reasons that Mr. Sanders' argument resonates with his supporters, but it ignores an even more basic problem. The energy contribution from shale and nuclear power is so large that if our goal is a reliable, low-emission energy mix that meets the future energy needs of the US economy, we simply cannot get there without them, at least not in any reasonable timeframe. The pie chart below shows the current sources of US electricity in terms of the energy they generate, rather than their rated capacity. This is an important distinction, because the renewable electricity technologies that have been growing so rapidly--wind and solar--are variable and/or cyclical, generating only a fraction of their rated output over the course of any week, month, or year. For example, replacing the output of a 2,000 megawatt (MW) nuclear power plant such as the Indian Point facility just north of New York City would require, not 2,000 MW of wind and solar power, but between 7,600 MW and 9,400 MW, based on the applicable capacity factors for such installations. Now scale that up to the whole country. With 99 nuclear reactors in operation, rated at a combined 98,700 MW, it would take at least 375,000 MW of new wind and solar power to displace them. As the Post's editorial points out, money spent replacing already zero-emission energy is money not spent replacing high-emitting sources. At the rates at which wind and solar capacity were added last year, that build-out would require 24 years. That's in addition to the 36 years it would take to replace the current contribution of coal-fired power generation. It also ignores the fact that intermittent renewables require either expensive energy storage or fast-reacting backup generation to provide 24/7 reliability. That brings us to natural gas, the main provider of back-up power for renewables, and the "fracking" (hydraulic fracturing) technology that accounts for half of US natural gas production. Fracking has transformed the US energy industry so dramatically that it is very hard to gauge the consequences of a national ban on it, even if such a policy could be enacted. Would natural gas production fall by a third to its level in 2005, when shale gas made up only around 5% of US supply, and would imports of LNG and pipeline gas from Canada ramp back up, correspondingly? Or would production fall even farther? After all, one of the main factors behind the rapid growth of shale gas in the previous decade is that US conventional gas opportunities in places like the Gulf of Mexico were becoming scarcer and more expensive to develop than shale, which was higher-cost then than today. Either way, the constrained supply of affordable natural gas under a fracking ban would not support generating a third of US electricity from gas, vs. 20% in 2006. So we would either need even more renewables and storage--in addition to those displacing nuclear power--or, as Germany has found in pursuit of its phase-out of nuclear power, a substantial contribution from coal. One of the primary reasons cited by Mr. Sanders and others for their opposition to shale gas, aside from overstated claims about water impacts, is the risk to the climate from associated methane leaks. Here he would seem to have some support from the US Environmental Protection Agency, which recently raised its estimates of methane leakage from natural gas systems. Methane is a much more powerful greenhouse gas than carbon dioxide (CO2), so this is a source of serious concern. However, a detailed look at the updated EPA data does not support the contention of shale's critics that natural gas is ultimately as bad or worse for the climate than coal, a notion that has been strongly refuted by other studies. The oil and gas industry has questioned the basis of the EPA's revisions, but for purposes of discussion let's assume that their new figures are more accurate than last year's EPA estimate, which showed US methane emissions from natural gas systems having fallen by 11% since 2005. On the new basis, the EPA estimates that in 2014 gas-related methane emissions were 20 million CO2-equivalent metric tons higher than their 2013 level on the old basis, for a year-on-year increase of more than 12%. This upward revision is nearly offset by the 15 million ton drop in methane emissions from coal mining since 2009, which was largely attributable to gas displacing coal in power generation. In any case, the new data shows gas-related emissions essentially unchanged since 2005, despite the 44% increase in US natural gas production over that period. The key comparison is that the EPA's entire, updated estimate of methane emissions from natural gas in 2014, on a CO2-equivalent basis, is just 2.5% of total US greenhouse gas emission that year. 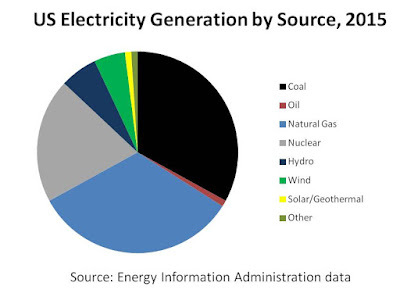 In particular, it equates to less than half of the 360 million ton per year reduction in emissions from fossil fuel combustion in electric power generation since 2005--a reduction well over half of which the US Energy Information Administration attributed to the shift from gas to coal. In other words, from the perspective of the greenhouse gas emissions of the entire US economy, our increased reliance on natural gas for power generation cannot be making matters worse, rather than better. That's a good thing, because as I've shown above, we simply can't install enough renewables, fast enough, to replace coal, nuclear power and shale gas at the same time. What does all this tell us? Fundamentally, Mr. Sanders and others advocating that the US abandon both nuclear power and shale gas are mistaken or misinformed. We are many years away from being able to rely entirely on renewable energy sources and energy efficiency to run our economy. In the meantime, nuclear and shale are essential for the continuing decarbonization of US electricity, which is the linchpin of the plans behind the administration's pledge at last December's Paris Climate Conference to reduce US greenhouse gas emissions by 26-28% by 2025. That goal would be out of reach without them. There are many other ways to make electricity, and coal brings nothing unique to the party. In a growing number of markets it is no longer the cheapest form of generation, and it is certainly the one with the most environmental baggage, from source to combustion. Coal-fired power generation is in competition with alternatives that are already producing at scale, like nuclear and natural gas generation, or growing rapidly from a smaller base, like renewables. It may not compete with all of these in every market, but few markets lack at least one of these challengers. The costs of renewables and gas have fallen significantly in recent years, due to major technology gains. Coal has also benefited from some improvements in scale and end-use technology. Today's ultra supercritical coal plants are more efficient than coal plants of a generation ago, but they are more expensive to build, even without carbon capture (CCS). However, wind and solar power continue to grow cheaper and more efficient, while gas has benefited from resource-multiplying production technologies and advanced gas turbines that can exceed 60% efficiency and ramp up and down rapidly to accommodate the swings of intermittent renewables. Despite all of these threats, coal is not on the verge of being forced out of power generation, even in developed countries where all the above factors are at work. Replacing its enormous contribution to primary energy supply and electricity generation will be a very heavy lift, particularly where another major energy source like nuclear power is being phased out. Germany is the prime example of that. Displacing coal completely from US electricity would require doubling the 2015 output of US gas-fired power generation and a roughly 36% increase in US natural gas production. By comparison, the US nuclear power fleet would have to more than double. If coal were to be replaced entirely by renewables, which in practice probably means gas pushing coal out of baseload power and renewables reducing gas-fired peak generation, the hill looks steep. Last year the US added 7.3 GW of new solar installations and 8.6 GW of new wind turbines. Assuming they were mostly sited in locations with reasonable solar or wind resources, their combined annual output should be around 35 TWh. At that pace it would take another 36 years to make up what coal now generates. It's true that net annual wind and solar additions continue to grow at double-digit rates, but keeping that up may get harder as the best sites become saturated and earlier wind turbines and PV arrays reach the end of their useful lives in the meantime. In other words, driving coal from here to zero seems possible but very difficult, even with an all-of-the-above strategy in a market without demand growth. And if electricity demand continues to grow, as it is globally, or resumed growing in the US and other developed countries to enable a big shift to electric vehicles, the prospect of retiring coal entirely recedes into the future.